EUROPE: A group of eleven major offshore developers and manufacturers have set a target of reaching a levelised cost of energy (LCOE) of €80/MWh by 2025, following energy minister agreement to collaborate more closely. Update: The UK has not yet signed the political declaration. The Department of Energy and Climate Change said: "There are statutory restrictions on government activity in the UK in the run-up to the [EU] referendum on 23 June." The article has been amended. A letter from the group to European energy ministers was issued ahead of an energy council meeting today. The eleven signatories are: Iberdrola, RWE, EDP Renewables, Statoil, Vattenfall, E.on, Eneco, GE Renewable Energy, MHI Vestas, Siemens and Adwen. 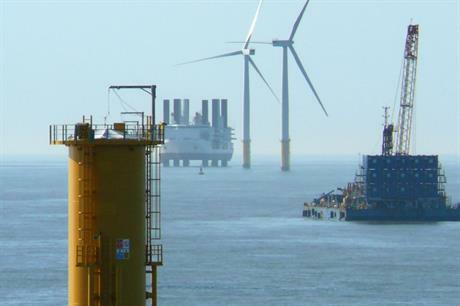 Offshore wind's largest developer Dong Energy said it was unable to become a signatory of the paper due to its ongoing initial public offering, but said it was committed to reducing the cost of offshore wind. The €80/MWh target would make offshore wind competitive with new conventional power stations. The industry is currently working towards a target of €100/MWh by 2020. "We recognise our responsibility to deliver industry and consumers with sustainable, secure and affordable energy. We look to policymakers to match this level of ambition," the letter's signatories said. "Policymakers at European and national level must set out clear visions for the industry after 2020 with robust laws that give investors peace of mind and visibility well into the future." The group also called on closer regional cooperation to remove investment barriers and reduce costs. At the meeting of energy ministers in Luxembourg, nine countries agreed a political declaration and work programme to cooperate more on renewable energy, particularly offshore wind. The countries are: Germany, France, Netherlands, Belgium, Norway, Sweden, the Republic of Ireland, Denmark and Luxembourg. The declaration will see the ten countries work more closely on planning, grids and financing, but also on coordinating the timing of tenders and explore joint support schemes. WindEurope (formerly EWEA) CEO Giles Dickson said: "The industry has reinforced the new commitments of the ten governments by making its own new commitment on cost reduction for offshore wind. Costs can continue to come down quickly, but the volumes must be right. "We now look to the ten Member States to deliver on the work programme. The industry stands ready to support. Together we can make offshore wind a central piece of a secure, affordable and sustainable energy system in Europe." Danish energy minister Lars Lilleholt said: "If the North Sea [can be] a Silicon Valley for offshore wind, it can promote very good business for Denmark and is a big win for the climate. There is great potential in developing joint projects, so we can utilise the best sites in the North Sea."